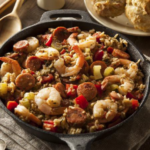 This awesome Jambalaya recipe is stuffed full of shrimp, sausage, chicken, peppers, and spices. It's a six alarm fire waiting to happen and it only serves up 1g of net carb per serving! Mix in crushed tomato., green bell peppers, zucchinis, Cajun seasoning, hot sauce, and chicken broth; bring mixture to a boil, reduce to a simmer, and cook uncovered until the liquid cooks off and the mixture is thick, about 15 minutes. Stir in chicken and shrimp and simmer until heated through, 1 to 2 minutes.